In this introduction to programming using TouchDevelop and the BBC micro:bit, students will create a “Magic 8-Ball” game. The game will work by generating a random predictions when the micro:bit is shaken or a button is pressed e.g. “Yes”, “Most likely” and “Outlook not so good”. In this introduction to programming using the BBC micro:bit, students will create a “Magic 8-Ball” game. The game will work by generating a random predictions when the micro:bit is shaken or a button is pressed e.g. “Yes”, “Most likely” and “Outlook not so good”. Note: Use these sites at your own risk. TeachwithICT is not responsible for the content of external Internet sites. Note down some of the students findings and ask the students how they think the game works. Try to draw out answers such as “answers are randomly generated” and “answers chosen from a list”. 3. Challenge students to create an alternative version of the classic 8-Ball game in which the user has to shake their device (using the accelerometer features on the micro:bit to receive a prediction. 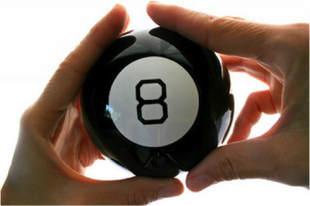 Direct students to swap places with a partner or person next to them and try out their Magic 8-Ball game. Instruct the students to suggest at least one improvement. After a few minutes, ask the students to return to their seats and make any suggested improvements. Students can continue to work on their Magic 8 Ball game and publish their script when they have finished.